We welcome all dogs large or small and young or old. If however your dog is known to be nervous, aggressive or has any specific dislikes please advise us so we can take steps to avoid stress to both pet and staff. Dogs must be fully inoculated against Distemper, Parvovirus, Hepatitis and Leptospirosis and must be kept up to date with the annual booster. 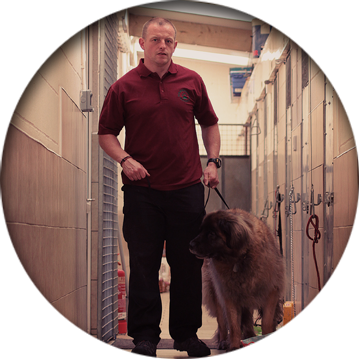 As per the licensing requirements an up to date certificate must be produced for our inspection each time your dog is boarded. Once vaccinations are complete and effective a new puppy may be boarded. Should you choose to also vaccinate against kennel cough we ask that this is done at least two weeks prior to arriving at the kennels. Our spacious accommodation is purpose built to provide comfort and security. Each dog or family unit has an individual inside sleeping area with an attached outside covered run. The sleeping area is shut at night to keep your pet warm and secure and is heated in winter months. Runs are cleaned daily or more often if necessary and your dog is free to wander between their sleeping area and run all day. 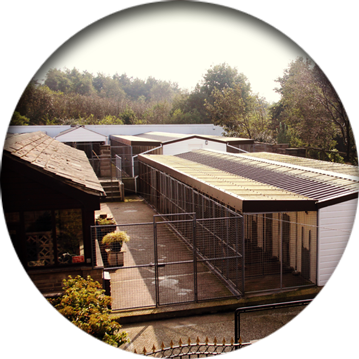 We endeavour to take the dogs out for a walk daily (weather permitting) in our tree sheltered exercise area. Dogs are always walked on their own unless they are housed with another family member. Plastic beds in a range of sizes and both food and water bowls are provided. • Your confidence and or lack of it will rub off on your pet. Try not to bring the whole family in tears when leaving your animal for the first time. A confidently left pet is a confident pet. • A short trial boarding period may help both you and your dog come to terms with the boarding concept. • Give your pet time to get used to their new surroundings by delivering earlier in the day rather than right on closing time. 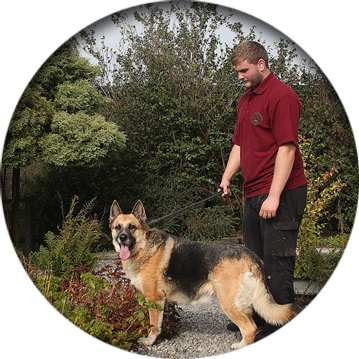 Our day board service allows dogs to be dropped off in the morning and collected before closing. While spending the day with us they can enjoy the same facilities as our overnight guests. Most popular brands of dry and wet food are stocked and though dogs are typically fed once a day we are happy to work round your routine. We can also cater to a dog’s particular dietary requirement and also welcome any owner who would prefer to bring their own food or medicated diet. If your dog is on medication please provide us with details of dosage and how it is usually administered so that we can keep to their routine. 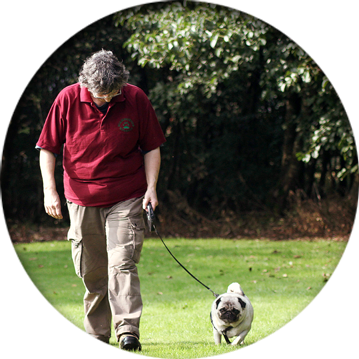 We also cater for diabetic pets that need their insulin injections at no extra charge. If your dog is travel sick please try and remind us not to feed them on their departure day. each per small dog and £2.75 each for medium and large dogs. • All fees are payable in full at the start of your pets stay by cash or card.